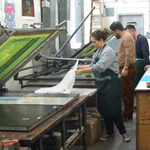 There is a wide range of facilities at our Kingston School of Art, Knights Park campus, where this course is based. Kingston School of Art, Knights Park is our art, design and architecture campus and is situated on the Hogsmill River, with its restaurant and bar opening on to the waterside. The relatively small campus has a friendly, creative feel and benefits from recently refurbished workshops and studios, a reception area with a gallery, art shop and space, and the light and airy open-plan learning resources centre. There are also well-equipped lecture theatres, seminar rooms and computer resources on campus. 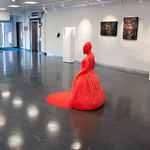 Find out more about the Kingston School of Art, Knights Park campus. Many of our art, design and architecture courses focus on studio-based learning – it is here that your ideas come to life. This is why we provide great workshops and the latest equipment to support and enhance your learning experience. We have recently expanded and upgraded our workshops, enabling you to work alongside and be inspired by students from other creative disciplines. Our specialist support and technical staff will help you get the most from our facilities. In the first year, for example, introductory sessions give you the skills you need to use all of our workshops. architectural science and technology laboratory (ArchiLab). Find out more about our studios and workshops on the Kingston School of Art at Knights Park campus. The learning resources centre (LRC) at Kingston School of Art, Knights Park is the perfect place to study. It has specialist book and journal collections, a wide range of electronic resources, including image databases, and a large slide collection. The LRC was re-opened as the Dame Elizabeth Esteve-Coll Centre in February 2012 after a major redevelopment. Located on the ground floor near reception, the LRC is at the heart of the campus. Find out more about the learning resources centre on the Knights Park campus.